A white under counter Bosch large capacity tumble dryer. 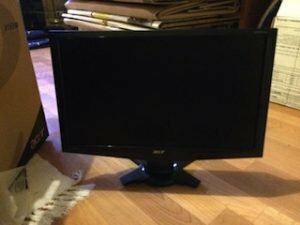 A black Acer flat screen 19 inch computer monitor. 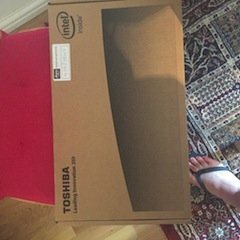 A brand new boxed Toshiba 13.3 inch 16GB Chromebook laptop. 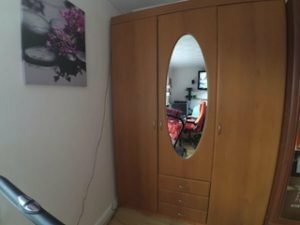 A tall standing solid wood vintage tripled wardrobe, inlaid with an oval mirror above three drawers. 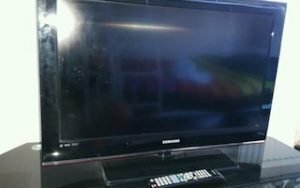 A black 19 inch flat screen Samsung television. 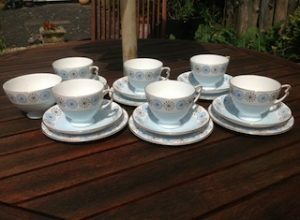 A collection of blue patterned fine bone China teacups, saucers and side plates. 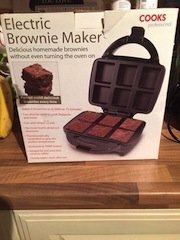 A brand new boxed Cooks Professional black brownie maker. 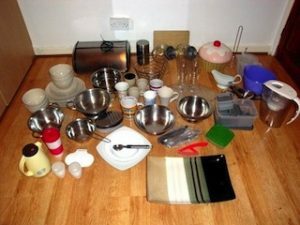 A large collection of kitchen accessories, to include a stainless steel bread bin, mixing bowls, a diner set etc. 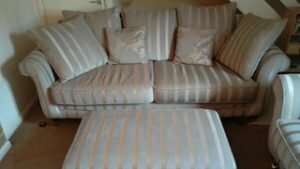 A three piece sofa suite, to include a two seater high back sofa, an armchair and matching storage footstool. 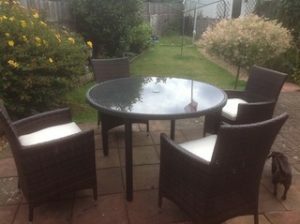 A large glass topped circular cane dining table, together with four square backed armchairs. 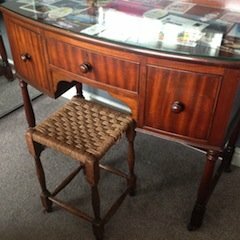 A vintage solid wood glass topped vanity dresser, having a large drawer to either side of a central drawer, together with a cane stool. 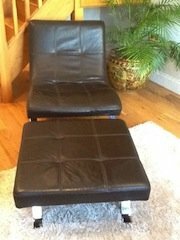 A relax back curved lounge chair on chrome legs, together with a matching square footstool, upholstered in chocolate brown faux leather. 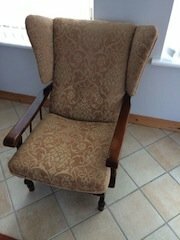 A vintage wing back fireside armchair on a solid mahogany base, upholstered in cream damask patterned fabric. 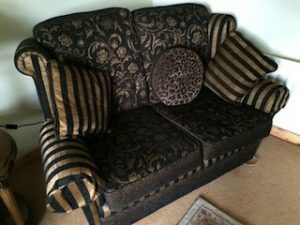 A two seater high back sofa, upholstered in gold and black striped and floral patterned fabric. 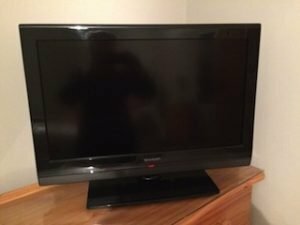 A black Sharp 22 inch flat screen television with a built in dvd player. 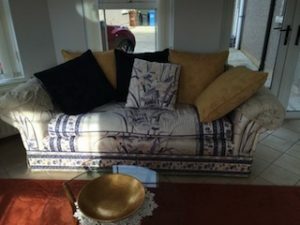 A two seater low back vintage sofa, upholstered in a blue and pink Japanese patterned fabric. 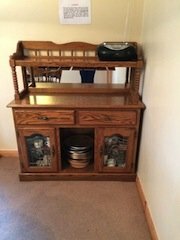 A solid wood vintage kitchen dresser, having a shelf above two drawers and two glass inlaid cupboards. 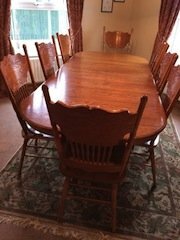 A large solid wood oval dining table, together with eight high back heavily carved dining chairs. 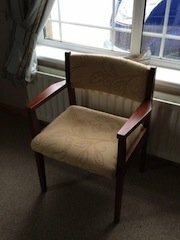 A vintage solid mahogany curved back hall chair, upholstered to the seat and back rest in leaf patterned cream fabric. 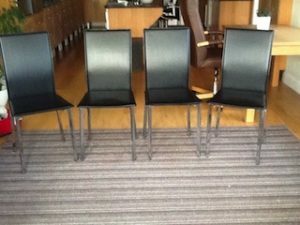 A set of four high back dining chairs on chrome legs, upholstered in black faux leather.